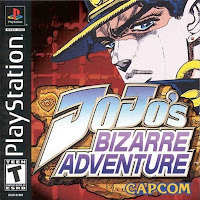 Based on Hirohiko Araki's venerated manga of the same title, Capcom's JoJo's Bizarre Adventure was a 2-D fighting game originally released on arcade in 1998. A followup, JoJo's Bizarre Adventure: Heritage for the Future, featuring additional moves and characters, was released a year later, and both games were compiled on a single disc and ported to the Sega Dreamcast that same year. But, while those were very fine 2-D fighters, as expected from the house of Street Fighter, I'm here to talk about the version released for Sony PlayStation. What made the PS1 game a standout, far more so than any of the other versions, was the "Super Story Mode," which was by far the best single-player mode ever offered in a fighting game. Surprisingly lengthy and entirely linear, it was not an RPG, though it possessed a better plot than many, and better combat than just about all of them. From beginning to end, the mode closely followed the events of the third and most popular storyline of the manga, the 152-chapter Stardust Crusaders arc. 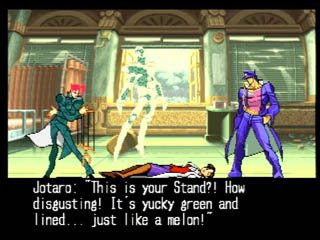 Stardust Crusaders featured the debut of the "Stand" concept, which later became a signature of the series. The heroes and villains all possessed Stands, symbiotic spirit partners with super abilities. This concept was translated to the gameplay through the implementation of a Stand button, which could be pressed to turn a character's Stand on and off. With the Stand off, the player relied on a character's basic martial arts, while the Stand would only manifest briefly as needed to block attacks or perform special moves. With the Stand on, however, it was as though the player were controlling two characters at once, since many Stands took companion forms alongside their human partners. With both human and Stand working in tandem, additional moves and techniques could be accessed, with the tradeoff being that the now more vulnerable Stand would become susceptible to a "Stand Crush," whereby enduring too many blows would cause the Stand to retreat and leave the human character momentarily stunned and defenseless. Some characters did not have companion Stands separate from themselves, however, and these consequently played more like traditional fighting game characters. Following the format of a manga, the Super Story Mode was broken up into thirty-five chapters, plus four extra chapters once the main story was completed. Each chapter began with some narrative via a mix of classic Ninja Gaiden-style still-image cinema sequences and segments crudely acted out using the regular battle sprites. The stage would then switch to gameplay, usually in the form of a one-on-one fight, with both the player character and opponent determined by the story. Aside from just the 2-D fighting, however, the mode featured tons of mini-games, with some episodes taking the forms of rudimentary beat 'em-up stages, simplified light gun stages, one pretty inventive horizontal shooter mission, and maybe a few too many quick time event sequences. The variety of play modes allowed the narrative to develop far more organically than the nonsensical excuses for story modes in other fighting games, where characters would typically just run into each other and then suddenly engage in one-on-one bouts for no good reason before moving on to the next fight. Each chapter also had a "Secret Factor," a hidden goal that could be earned by completing the stage in a manner consistent with the manga. For example, the very first chapter was a one-on-one fight that took place in a prison. As the story went, the protagonist and player character for the stage, Jotaro Kujo, spooked by his own recently discovered Stand powers, had forced his way into a prison cell, stating his adamant refusal to come out. Unable to reason with him, Avdol, a family friend, decided instead to attack Jotaro, but the fighting was merely a ruse to lure Jotaro outside his cell. 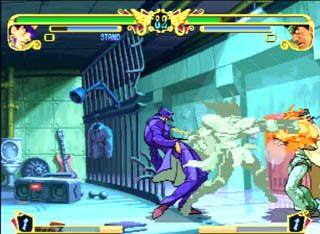 The condition for the Secret Factor, therefore, was to finish the fight on the right edge of the stage, so that Jotaro was positioned outside the cell depicted on the 2-D background. Along with the mini-games, the Secret Factors further spiced up the gameplay, giving the player more to do than just exploit AI blind spots, as was the case typically with the single-player experiences offered by other fighting games. But, since the objectives were hidden, success depended largely on a knowledge of source material that was not readily available in North America. Also, some of the objectives required that the AI characters act in a certain manner, which the player couldn't really control. The final chapter had the player controlling Jotaro against the vampire Dio Brando. To earn the Secret Factor, the player had to first allow Dio to pull off his Level 3 Super Combo, "Stop Time", which used his Stand's ability to freeze time around him. Then, while time and Jotaro were frozen, the player would have to input the command for Jotaro's own Level 3, "Star Platinum The World," which mirrored Dio's time-stopping ability, thereby allowing Jotaro to move freely within the frozen world. Finally, since Dio would have activated his ability first, he would consequently run out of juice first, at which point he would become the frozen one for as long as Jotaro's ability remained active, and the player would have to win the match by defeating the helpless Dio during those brief seconds. In dozens of attempts, I never once even got Dio to perform Stop Time, let alone in such maddeningly specific circumstances. Aside from the Super Story Mode, the game also included the usual arcade, versus, and training modes, which were much the same as in any other fighting game. Despite the existence of the Super Story Mode, the arcade mode still came complete with intermittent cinema scenes and endings for each character. The arcade game ran on Capcom's CPS3 hardware, the same system that powered the silky smooth Street Fighter III. For reference, CPS2 ports to the PS1 were already pushing the console to its RAM limits, with titles like Street Fighter Alpha 3 and Darkstalkers 3 suffering from cut frames of animation, while the tag-team Marvel titles lost the tag-team element altogether. So it didn't seem feasible that a CPS3 title could be ported to the PS1. To be sure, sacrifices had to be made, with frames dropped here and there, and the Stands, in particular, saw noticeable drops in color and detail. But the gameplay arrived mostly intact, and, while the mechanics and interface were based more on the first arcade game, the PS1 release managed to include all of the characters from the second game, as well as the few additional characters exclusive to the home versions. For a more faithful translation of the arcade experience, the Dreamcast version was certainly by far the preferred choice, but it offered only straight ports, with nothing comparable to the Super Story Mode. The Capcom game was actually the English-speaking world's first exposure to the franchise, and, more than a cultural gap, the localization process had legal hurdles to overcome. Nearly all of the character names were Western music references, and, while it was somehow okay for Araki to use them in Japan without ever getting permission, under the more scrutinizing eye of America, Capcom opted to barely obscure the original references, with such changes as "Rubber Soul" to "Robber Soul" and "Kenny G" to "Ken-E-Gee." At the other end of the spectrum, changing "Muhammad Abdul" to "Avdol" and "Mariah" to "Mahrahiah" was probably excessive. And, of course, "Vanilla Ice" was renamed to "Iced," probably more to preserve dignity, I suspect, than to avoid legal trouble. I'm not sure if Capcom came up with these changes itself, but names like "Avdol" and "Iced" have since become standard among the English releases of the manga and anime as well. While the Super Story Mode may have been thrown in as compensation to PS1 owners to make up for the fact that their version was technically inferior to the Dreamcast's, it ended up as not only the best single-player mode in a fighting game, but also probably the best comic-to-game adaptation I've ever experienced. I've often wished that Capcom would have implemented such a mode in one of their Marvel games, or, heck, in Street Fighter even. But what do you get for attaining the "Secret Factor"? Just the game telling you that you got it? Or were there material rewards? There were unlockable galleries, but the main incentive for doing them was just the satisfaction of having them checked off on the summary screen.